Christy O'Connor Junior is planning to ride off into the sunset at the end of this season - with Jack Nicklaus' scalp under his belt. The 53-year-old Galwayman plans to give up life as a fulltime touring professional and concentrate on golf course design. But O'Connor Junior wants his final full season to go down as one of his best ever. And he badly wants a crack at winning his third Senior British Open title at Royal County Down, with close friend Jack Nicklaus in the field. "It would be fantastic to win the Senior British Open again after everything that I've been through over the past year," he said. 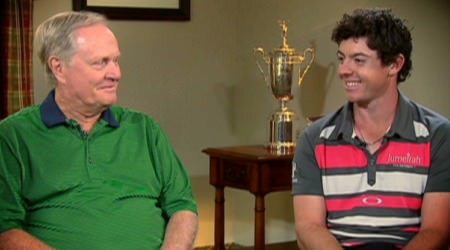 "I hear that they're putting together a great field and that Jack Nicklaus could be back again this year. To win with Jack in the field would be fantastic and I hope he can make it. "I consider him a friend. When my son Darren was killed in a car crash Jack wrote to me and he's kept in touch since then and he also wished me well after my accident." Organisers hope to bring a galaxy of stars to this season's Senior British Open. European Seniors Tour director Andy Stubbs has been in touch with superstars Nicklaus, Tom Watson, Hale Irwin, Arnold Palmer, Larry Nelson and Ray Floyd about the possibility of playing at the Newcastle venue from July 25 ­ 28. Said spokesman: "Nothing has yet been confirmed but Jack Nicklaus' company has already been in touch about dates." "The tour director approached all the players of seniors age about playing in the Senior British Open during the UBS Warburg Cup at the end of last year and we will make an announcement about the players who will take part at Royal County Down as soon as we have received confirmation." O'Connor Jnr has been practising hard over the past few months and will return to the fairways on February 4, just 10 months after fracturing his left leg when his Harley Davidson fell on him as he was cleaning it. The former Ryder Cup star heads for the US Next week where he intends to make his comeback ACE Group Classic in Naples, Florida in early February. "I'll play in America with a medical exemption this season but next year it'll be a case of half and half - playing some golf and designing golf courses." A serious candidate for the Ryder Cup captaincy at the K Club in 2006, O'Connor Jnr is desperate to win again. "Can I still win? That's the mystery. After nearly a year without competitive golf it will be tough, very tough, to get back. Only time will tell but I'd dearly love to win again,' he said. "I hope to play in the US Senior Open, the US Senior PGA and the Tradition. But I can't wait to get back to Royal County Down for the Senior British Open. As two-time winner on the US Senior PGA Tour, O'Connor has been given a special medical exemption which will allow him to play in up to 24 events this season. "I won't play in that many ­ perhaps 16 would be my limit ­ but apart form the Senior British Open I'll be playing here in Ireland in the AIB Irish Seniors Open at Adare Manor." Course design takes up a lot of O'Connor's time these days and he expects to work on projects and China and Nigeria over the coming months. "Architecture is an area that I love and I'll become more and more involved in the future. "I still have the desire to play golf, which is important. So I'll play full time this season and then take it slightly easier after that. It's just hard to say goodbye." Des Smyth won his fourth European Senior tour title thanks to a closing 65 and a tip from Christy O’Connor Jnr. Pic: Getty Images.Des Smyth was inspired by a tip from Christy O’Connor Jnr as he captured his fourth European Senior Tour title in thrilling fashion with a sublime round of 65 at the Van Lanschot Senior Open. After finishing two strokes ahead of Australian Peter Fowler and American Tim Thelen thanks chiefly to a brace of eagles in a regal display at Royal Haagsche Golf and Country Club, Smyth paid a warm tribute to O’Connor, who noticed that his friend’s alignment was out of kilter. Christy O’Connor Jnr has turned to the belly putter in a desperate attempt to break his AIB Irish Seniors Open hoodoo.